After releasing the version 1.3 of the furniture catalog, I spent some time on improving the new Free 3D models page which displays the 800+ free models available in furniture libraries in a separate page, because the 3D models import page became too big and prevented many users to see the interesting information about furniture libraries and 3D models web sites that was at its end. Under the hood, there was also some big changes to reuse Sweet Home 3D and Furniture Library Editor classes on the server itself, to prevent copying and transforming at other formats information about the furniture libraries. This will greatly simplify the various updates I had to do when releasing new furniture libraries. I wanted also to offer more features in the new free 3D models page. This weekend, I added the ZIP file size of each 3D model under its icon. 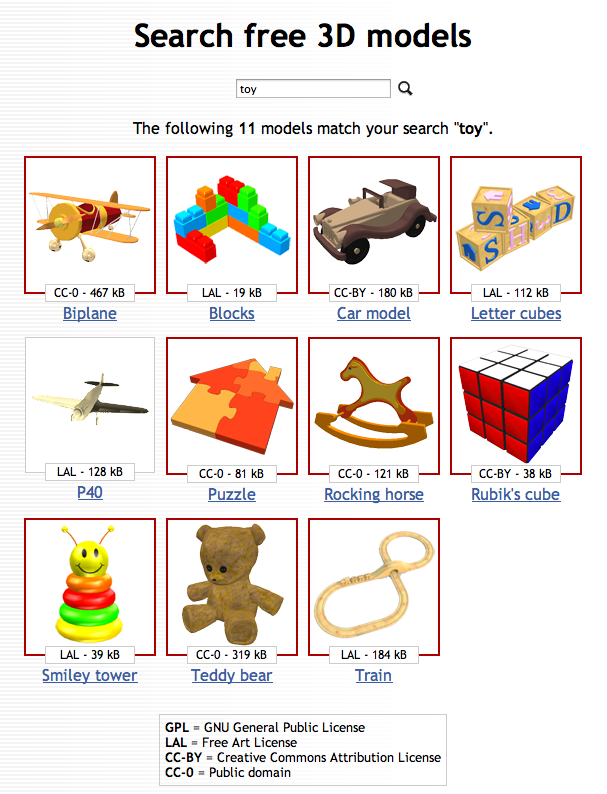 Today, I also added a search engine on this page to help users find faster a model. It's possible to search in all languages supported by Sweet Home 3D (even if the search result displays 3D models only in English or in French), and the search covers also some keywords I started to add in the furniture libraries to help find similar pieces. For example, you can search "toy" even if no furniture name contains toy. As you can see from the previous capture, 3D models found by the search engine are displayed in alphabetical order, and their license is also displayed. As before, the author of a model is indicated in the tool tip associated to its icon. Very nice. The listing of sizes is extremely useful and greatly appreciated (would be cool in the furniture list in sh3d too). The selection also makes me smile at the (wonderful) differences in Europe and beyond. But if indicating the size is easy on the server (it's equal to the size of the file you'll download), it's less easy in Sweet Home 3D itself, because that size may vary at the end depending on the user choice to Save or Save and compress his file. Quite, I understand. But in FurnitureLibraryEditor, they are all compressed, or? Guess the point for me is to avoid the bloated models. Consider the following elements in a quick sketch: (compressed) file of 16,8 KB. Not perfect, but MUCH value for size. PS - Textures and OBJ files are all up for grabs if anyone is interested.